This is a research done in the late nineties until 2003 by theoretical physicist C Johnson. Analysis of the official NIST data of nuclear energies indicates that there is a possibility atomic nuclei may be held together by electric forces rather than the special nuclear forces that are postulated in the standard model. This data, if confirmed by other researchers, could lead to a re-thinking and simplification of particle physics. The troublesome weak and strong nuclear binding forces of current theory may well turn out to be superfluous. We are hearing much about the electric nature of the Universe these days. 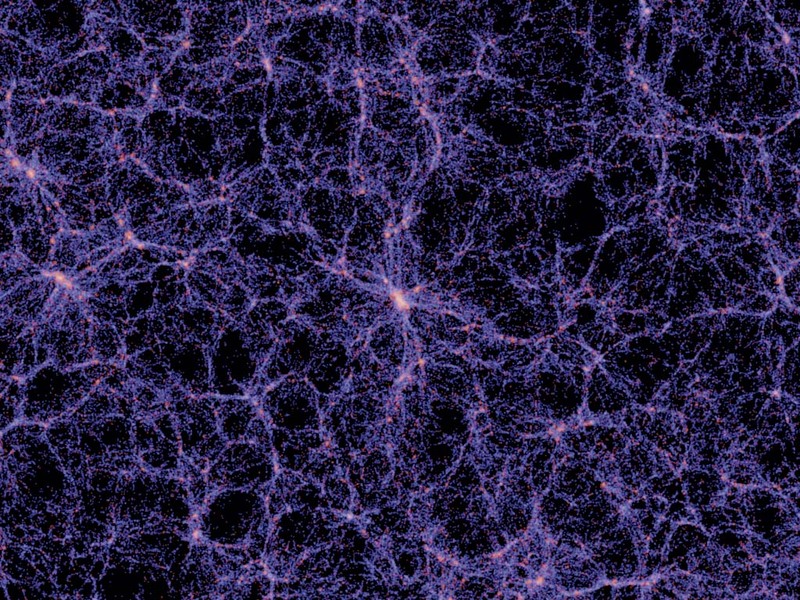 Galaxy clusters seem to be lined up in strings and networks, rather than randomly distributed as a merely gravity-based universe would indicate. There is also evidence of huge electric currents in space many of which connect stellar and galactic objects. The paper re-analyses Einstein's thought experiments on moving observers and comes to a quite different conclusion. The concept is that each planet, star and galaxy creates its own local medium body, and that those bodies or spheres of influence are separate but interact with each other. Those spheres of influence are real physical spaces with their own characteristics, not "inertial reference frames" as Einstein postulated. This is the best analysis of those Einsteinian concepts on relative velocities I have seen, and so I would like to share it here. "There is no perfect vacuum space in the universe. Medium consisting of particles always exists between the wave source and the receiver. The theory of relativity, based on the concept of perfect vacuum, is wrong and meaningless in physics." What are the underlying causes of gravity and magnetism? For me, this has been a slowly maturing concept. I am sharing my thoughts here and would like to get your feedback. Yes, I am going against much of the "received wisdom" of science. Just take these thoughts as a pointer, an invitation to look at things from a different point of view. Perhaps much of this will be found correct as time passes, but then ... perhaps not. Terms: I know that there is supposed to be a difference between the two terms gravity and gravitation with the first referring to the earth's gravitational attraction and the second to the phenomenon in general, but here I am using both terms to refer to the phenomenon as such. Spin is generally used to describe the twisting motion inherent in particles, while rotation refers to an accumulation, a mass of particles, for instance a planet, rotating as a whole. Gravitation, as observed and modeled by mainstream physics, seems to be insufficient to explain the continued existence of galaxies as unitary systems. There just doesn't deem to be enough mass in all those numerous stars to be able to hold them galaxies together by gravitational pull alone. Mainstream scientists resort to such nebulous concepts as "dark matter" to explain there might be a great deal of mass we just can't detect. I do not think that is a good way to approach the problem. To make any headway in this, we actually need to conceptualise the cause of gravity, something which physicists have been quite reluctant to do ever since the times of Newton, who described gravity, but when asked what the cause was, he recused himself with the words ("hypotheses non fingo") or "I'm not proposing a hypothetical mechanism." We are associating gravity with mass, but we have no conceptual understanding why masses "gravitate" towards each other. There are theories all right, and there is much discussion, but we have no agreed way of modeling the cause of gravity. There is a very common illustration of a ball pulling a flat sheet out of shape to represent Einstein's curvature of space but that depiction of the concept is not really accurate. We do not live in a two-dimensional world of sheets of flat space-time and gravity isn't just a bending, but a twisting curvature. Imagine the ball rotating and thus distorting that matrix of space to create a vortex in the space matrix, and you'd have a good analogy. We should really think of space as a 3-dimensional matrix filled with "potential" particles. That matrix seeks to arrange itself in orthogonal patterns, but it can also be slightly twisted out of shape by a rotating mass sitting inside that spatial matrix. The distortion would be a twist, a vortex form, in the space matrix. I am postulating that gravitation is in essence a consequence of rotation or 'spin'. The spin of particles causes gravity, and the effect is additive, meaning the more particles are in a mass, the stronger the common gravitational field. The rotation of macroscopic accumulations of matter - planets, stars, black holes and galaxies also causes gravity. 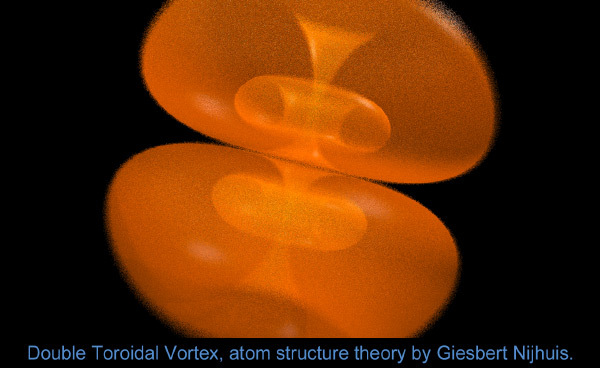 Both twist (distort) 3-d space and so induce a vortex-shaped region of stress that spreads far and almost instantly, due to the rigidity of the space matrix. Two or more of those stressed regions of space have attraction for each other. The space matrix strives to unstress. It can't unstress by itself, as the rotating mass keeps distortion constant. But it could find some stress relief by bringing two particles that have a stressed field closer to each other. So gravitationally stressed areas of space have a definite affinity for each other, they attract, in an effort to relieve stress. Distortion of space takes the form of an extended vortex, eventually folding in on itself, creating a spherical field. The distortion of space itself does not need to propagate like radiation does, it adapts almost instantly to changes. Remove the source of distortion and the field collapses. All of the distorted space snaps back to normal. The effect of gravity is thus not limited by the speed of light, it has quasi-instantaneous long distance effects. I could imagine applications in advanced, superluminal communications if we learn to modulate gravity like we do radio waves today. Macroscopic rotation of particle accumulations is additive to the effect of quantum or particle-spin induced gravity. We thus have a doubling of the force in the sense that the effects of particle spin and macroscopic rotation are separate and additive. The twisting of space-time by the rotation of a star or planet combines with the effect of the rotation (spin) inherent in the mass of the individual particles that constitute it. This gives rise to to a prediction: A non-rotating body of mass should be found to have a smaller overall gravitational effect compared with a rotating body of the same composition. Actually, Prof. Eric Laithwaite was experimenting with spinning masses in the 1950s and he found definite changes in their gravitational properties when spinning at high rates. Here is a video showing how a heavy mass can be "insulated" against normal gravity, it can kind of "go its own way" just because it is spinning at a high rate. The demonstration in the video is quite instructive. You can find more videos on Laithwaite's experiments with gyroscopes that exhibit anomalous gravitational properties. Unfortunately, the scientific establishment of his time was so embarrassed to not be able to explain those anomalies that they simply resolved to cut Laithwaite (who is the inventor of maglev trains) off from all collaboration and funding. The facts were suppressed and the experimenter ostracised. The strength of the gravitational force is determined by two parameters: The amount of mass involved, and the rotational speed or angular momentum of the mass rotating in space-time. Magnetism also involves spin, and it would seem to be a close cousin of gravitation. However in contrast to gravitation, magnetism appears to have the dynamic characteristics of an energy flow, rather than those of 'attraction by affinity' of an essentially static distortion of space-time. Magnetism is a much stronger force than gravity, but its effects are felt over a very much shorter distance. Perhaps the strong and weak force observed in particle interactions are the particles' magnetic and gravitational field effects. Electric Universe proponents hold that the cosmos is permeated by electromagnetic currents that link the heavenly bodies in a constant dance of energy exchange. What they say makes sense, but in my view something important is missing. Each and every rotating mass, from planets to stars to galaxies actually creates both gravity and magnetism as a consequence of its rotation, giving rise to not only gravitational but also electromagnetic effects. Magnetic fields have been shown to be present in space and they follow the spiral patterns of galactic vortices. 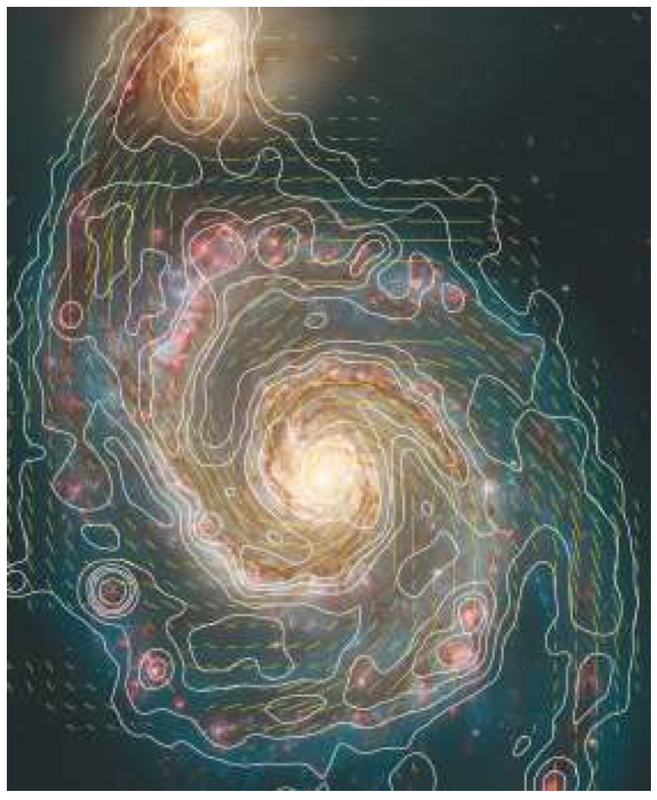 This illustration is from a paper titled Magnetic Fields in Galaxies. Ferromagnetism or "permanent magnetism", is a special case. Some materials - iron is the most well known - can set up permanent magnetic fields by the configuration and alignment of the material's internal 'domains'. The alignment of magnetic domains comes about when ferromagnetic material is exposed to a strong magnetic field while still in a plastic state. The alignment of those domains will then set up a vortex-shaped path which encourages magnetic currents to flow. Those currents - also described as magnetic field lines - are twisting flows of space energy. They exhibit mutual attraction and repulsion, depending on polarity. In recent times, permanent magnets have been combined in novel ways to create and maintain imbalance of their respective attractive and repulsive forces, while transforming the energy of the magnetic flow into kinetic, rotational energy. 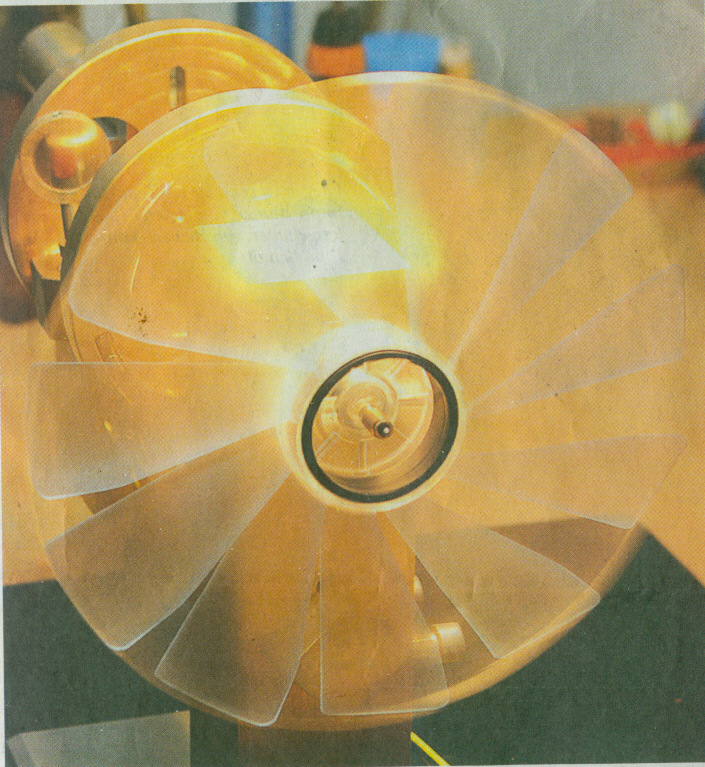 An example of this is Yildiz' permanent magnet motor as demonstrated in the following video at the University of Delft in the Netherlands. It appears that groups of rotating magnets, such as the 1200 permanent magnets contained in Yildiz' magnetic motor, or the magnetic rollers John Searl employed in his early generators, may set up their own secondary and more powerful magnetic field with effects which are different from the combined effects of the stationary magnets. Much like the rotation of a star or planet would increase the gravitational effect, the rotation of groups of magnets appears to weave a more intense field of magnetic interaction. 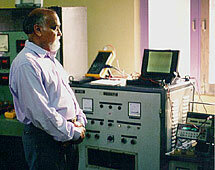 Ionisation and anti-gravity are among the effects that have been reported by some experimenters. We see vortex shapes everywhere in nature. They are obvious in galaxies and black holes, but are present in many everyday phenomena. Hurricanes and tornadoes are vortical air flows, sea shells follow vortical growth patterns. The shape and flow pattern is ubiquitous throughout the universe. Any source of rotation induces a space-time vortex. It is the vortex that twists the space-time matrix out of shape and that twisting in turn causes both the gravitational and the magnetic effect. Primer Fields, as I understand the theory gives us a very similar perspective. David LaPont posits that every particle, every planet, every star and even galaxies are the result of the action of two opposing bowl-shaped magnetic fields. In a series of videos, David LaPoint describes how two opposed bowl shaped magnets can actually cause a rotating plasma to manifest, when exposed to strong DC electric current in a vacuum chamber. The resulting magnetic field is a structured entity. It arranges particles into regular polygonal structures. The configuration of the magnetic fields explains how particles may join to form elements of matter. It also provides close match parallels for the visible structure of the galaxies we see in space. In this first video, LaPoint describes in detail how the magnetic fields in his experiments are configured and how they act to order matter particles. He also proposes a mechanism for the magnetic ejection of matter along the plasma's axis of rotation. Sacramento Bee, Mar 7, 2015: Tens of thousands of pups birthed last summer are believed to be dying on the islands... some [are] desperately trying to climb onto small boats or kayaks... Scientists noted a worrisome anomaly in 2013, when 1,171 famished pups were stranded... scientists blamed the phenomenon on unseasonably cold waters... On San Miguel... Melin said researchers believe "probably close to 10,000 are dead, and we expect more to die over coming months"... the mortality rate is similar on San Nicolas. So it appears this situation of sea lions starving has been going on for some time and it's building up to where it just can't be ignored any longer. Thomas Engel is a successful German inventor with more than a hundred patented inventions to his credit. He - like many of his peers - does not look back at a successful school education, but evidently that is not necessary for success if you are smart and, as some say it might even be counter productive, stifling creativity. Engel has figured out the working principle of a type of motor many inventors and tinkerers have been working on - so far unsuccessfully. He found a way to make permanent magnets do actual work, transforming their attractive and repulsive power into the true motive action of rotary motion. A recent article in the German daily Frankfurter Allgemeine Zeitung (12 November 2013) recounts a visit of the paper's technology editors to the inventor's home and their impression of the new motor Engel says he wants to 'give away'. While the article is carefully written to avoid trouble and while it quotes the obligatory university experts saying why such a motor is impossible, it does give enough detail to allow us to understand the concept. If you want to start experimenting, be warned: There is a lot of force in those rare earth magnets, they can be dangerous to the unprepared. 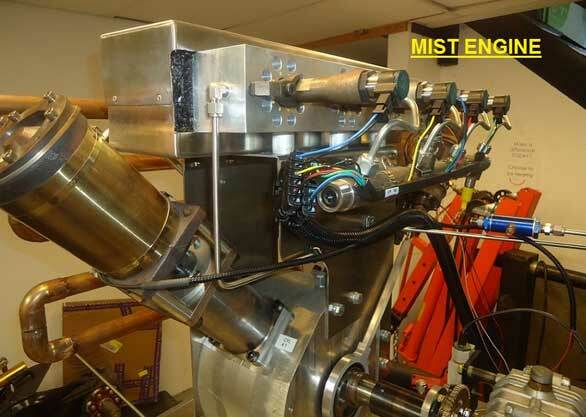 Richard Aho of MIST Energy Systems has been working for years on the idea that hydrogen bond energy could be harnessed. He went on working where others had abandoned the field because they knew it "couldn't be done". In his Mist Energy System, water is pressurized by a commercially available high pressure pump, it is then released through a nozzle into an impact chamber, where the jet hits a metal target. Heat is released and the water instantly transforms into steam. The energy spent to pressurize the water and pre-heat the impact chamber is about one tenth of the energy contained in the steam that is produced. That is a 10:1 over-unity factor, achieved with nothing but available tech and water as a medium. Of course steam is what has been driving our electricity-producing machines for a long time. The heat is usually supplied by burning carbon fuels like coal, oil or gas. Even atomic power plants are little more than very expensive - and rather dangerous - steam engines fired by the heat of radioactive elements. So if we could make the needed steam without recourse to carbon based or atomic fuels, would that not be a giant step forward? I believe it would, and the technology is available. 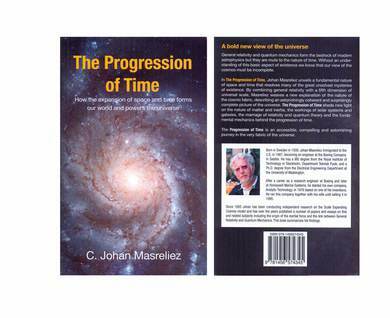 In a recently published book titled "The Progression of Time - How the expansion of space and time forms our world and powers the universe", C. Johan Masreliez, a retired Engineer passionate about physics and cosmology, introduces the concept of a fifth dimension beyond four-dimensional spacetime. The Scale Expanding Cosmos (SEC) model overcomes some serious limitations of the Standard Cosmological Model. It eliminates the need for a Big Bang creation-out-of-nothing event at the beginning of the universe that is making today's cosmology little more than an article of faith. It explains what motion is and how time progresses. 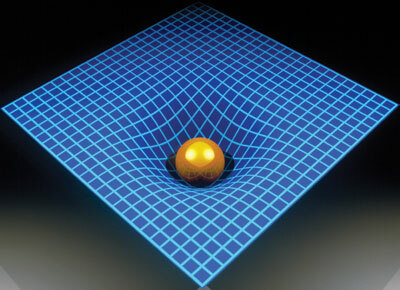 Inertia becomes understandable, being modeled in the SEC theory as a curvature of the 4-dimensional space-time continuum, in a manner very similar to how Einstein describes gravity in his General Theory of Relativity. The dynamically expanding scale dimension explains the seemingly endless energy supply of the universe, saving us from gradual decline into an ignominious heat death. It also resolves several of the paradoxes of Einstein's Special Relativity and provides a stable cosmic frame of reference, something Einstein could never quite get to grips with, in addition to allowing Quantum Theory to be derived from the equations of General Relativity. Quite a revolution in our understanding of the universe, the new model might have a hard time gaining acceptance by physicists, but it is an important step in advancing our understanding of the mechanics of the things physics is supposed to explain. According to Tewari, the universe is filled with an incompressible super fluid. Fundamental particles are vortices that create a tiny spherical void, where circulation at the limiting velocity of light leads to a breakdown of the fluid's integrity. The discontinuity at the void/liquid interface defines the particle boundary. Tension in the external fluid created by the central void gives rise to gravity, while the tangential circulation of the fluid at the interface is the cause of electric field phenomena. If the universe cannot be described through your theories with clear-cut physical pictures that a lay man can understand, the following may set you thinking as to where your concepts went wrong. This departs radically from your 20th century concepts that need deep revision. You held the field and had your say for more than a century now and have led science to the games of probability and uncertainty, of mere chance and coincidences, based on outer appearances rather than the underlying reality. The General Science Journal is a non-peer-reviewed electronic journal that allows all scientific opinions to be aired, particularly in physics. Research papers, essays or communications are accepted in multiple languages for viewing by your colleagues and the general public. They may be submitted at no cost to the respective GSJ Editors (see listing below). The original of this article is in Russian and this translation of it isn't professional, but I think the news of this is of importance for us and should be shared even if imperfectly. Chances are, you have not heard of the Republic of Bashkortostan. 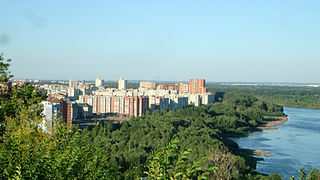 It is one of many individual States that were part of the old Soviet Union, the USSR, and that now are part of the Russian Federation which formed after the Soviet Union dissolved. Wikipedia has an article on history and more here: Bashkortostan The people of Bashkortostan are the Bashkir. So now that we have some context, here is the article. The original in Russian is also available. The Supreme Court of Bashkortostan allowed the villagers of Shaymuratova to pay in "shaymuratikami." It is a kind of local money - or rather, trade coupons. They can buy products only in one village. A system of mutual settlements is offered by local farmers. But the local prosecutor sought to prohibit this kind of currency . go to the date-ordered archive linked here.